O/o District and Sessions Judge, Udalguri. 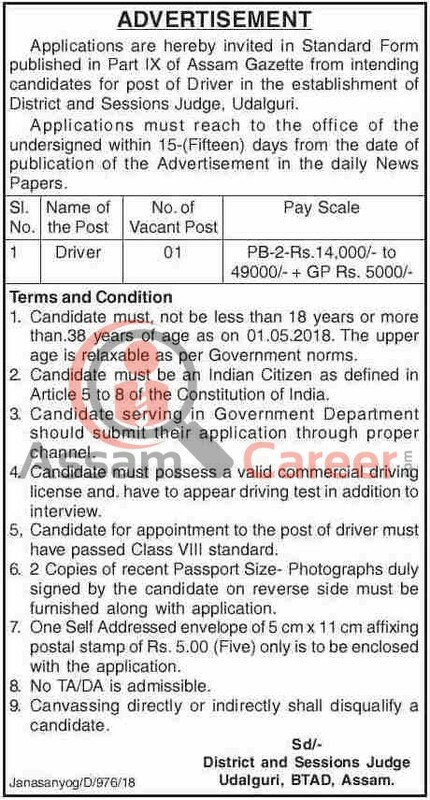 Applications are hereby invited in Standard Form published in Part IX of Assam Gazette from intending candidates for post of Driver in the establishment of District and Sessions Judge, Udalguri. Educational Qualification: Candidate for appointment to the post of driver must have passed Class VIII standard.Candidate must possess a valid commercial driving license and. have to appear driving test in addition to interview. Age : Candidate must not be less than 18 years or more than.38 years of age as on 01.05.2018. The upper age is relaxable as per Government norms. How to apply: Applications must reach to the office of the District and Sessions Judge, Udalguri within 15-(Fifteen) days from the date of publication of the Advertisement [18th May 2018] in the daily News Papers. 2 Copies of recent Passport Size- Photographs duly signed by the candidate on reverse side must be furnished along with application. One Self Addressed envelope of 5 cm x 11 cm affixing postal stamp of Rs. 5.00 (Five) only is to be enclosed with the application.